Does your child love to read?? Well, mine doesn’t love it. He has been a struggling reader, a reluctant reader, a complaining reader, a bored reader, a frustrated reader…. However, recently we have emerged into new territory. He is now a slightly confident reader who is branching out and finding books he enjoys. Dare I say that he might occasionally enjoy reading? He just might! Maybe…. Whether you have a somewhat reluctant reader or an eager reader, you can never have too many wonderful books to keep them busy. 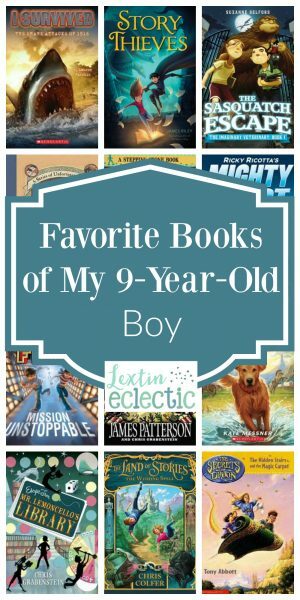 Today I’m sharing the list of the books my son chose as his current favorites. If you look through this list you will see that the reading level varies widely! Sometimes he still reads books that are below his reading level. I encourage this to help him build his fluency. Sometimes he reads books that are right on target for his level. With these books he can simply enjoy the story and continue to work on his reading skills. Sometimes he reads books that are challenging for him, but he’s motivated to continue because the storyline is so compelling. These books push him to build on his reading and comprehension skills. So, if you look through this list, you’ll see books in each of the above categories. I love that he has a varied book list. But I’m most excited that he was able to choose so many books that he is currently enjoying. Did you read that? He is ENJOYING books. Maybe some of these books will prove enjoyable at your house too! My son just recently began reading this series and he is hooked. The books are about two kids who are an apprentice to a vet who treats imaginary creatures. You can imagine all the crazy adventures that follow as they help unicorns, lake monsters, and sasquatch. Take a road trip to some of the most outlandish destinations in the U.S. and learn some geography along the way. My son enjoys these adventures and I don’t bother to tell him that he might actually be learning something. Follow a family of treasure hunters as they explore the world, escape from villains, and plan daring rescues. These books from James Patterson are exciting and sometimes even funny! My son started reading this on the recommendation of his sister and he has really enjoyed these fairy tale adventures. In the books, two kids find themselves in a magical fairytale land and they have to face witches, wolves, goblins, and trolls as they battle to make it back home. These books are all based on huge historical catastrophes. They are each centered on a child who was able to escape the disaster. Lots of historical tidbits are woven into the stories. This is a series of easy readers, but my son has thoroughly enjoyed the storyline. The books tell of three friends who find a mysterious room under that stairs that transports them to another land. This is a favorite of all of my kids. We’ve read this book multiple times as a read aloud. My son was finally brave enough to read it on his own and he could not put it down. In the book, an eccentric game maker creates a game in the town’s new library and in order to escape the library, the children must put together all the clues. This is the most challenging book that my son has attempted so far. He is enjoying the story line even if the book took him a long time to finish. The story of a young girl who suddenly appears out of library book, her quest to find her father, and one boy’s adventure into another book, proved interesting enough to compel him to keep reading. A search and rescue dog who is too distracted to pass his test, finds items that transport him back into history where he is able to provide help and ultimately save the day. My son enjoys the dark humor and the colorful characters in this series of unfortunate events that befall some poor and very unlucky children. These graphic books are probably some of my son’s favorites. He loves the outlandish villains and the robot who helps to save the day. He has read all of the books in this series multiple times. Each book in this series starts with a different letter of the alphabet in this series of easy chapter books. Who doesn’t love a good mystery book? So, there’s our list of current favorites. I’m now starting a new search to refill his bookshelves with new choices to keep encouraging him to read! If you’re looking to add to your bookshelves too, you might consider this wonderful book. I have found many great book ideas between its pages! And you can also sign up for my newsletter and receive my complete Preschool – 5th Grade book list delivered right to your inbox. There are over 400 book titles included in the list! Do you have a struggling reader too? I’ve shared about some of our reading struggles in the past, but if you are dealing with the same challenges in your homeschool you might want to read some of my posts about our reading difficulties.